The New York Philharmonic rocks Amadeus. 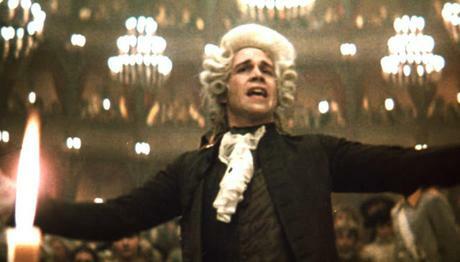 He died for our sins: Tom Hulce as Wolfgang Amadeus Mozart in Amadeus. Photo from the 1984 film, © The Saul Zaentz Group. The New York Philharmonic's ongoing The Art of the Score initiative seeks to expand the audience of America's oldest orchestra by having them play in a darkened theater underneath movies with classic (and classical) scores. This week saw the most ambitious entry in the series yet: a set of synchronized performances of the 1984 film Amadeus that featured the musicians and the Musica Sacra choir accompanying the Oscar-winning smash. The performances marked the debut of conductor Richard Kaufman, and were enhanced with the addition of three keyboard instruments including a portative organ. If you've never seen it, Amadeus is Milos Forman's enormous, lavish, beautifully costumed and lovingly shot adaptation of Peter Shaffer's Broadway play. It examines the short life of Mozart (Tom Hulce) through the envious eyes of his colleague Antonio Salieri (F. Murray Abraham). In a frame story, Salieri (who opens the movie by attempting suicide) is in an asylum. He is making confession to a bewildered and increasingly horrified priest (Richard Frank). Mr. Abraham won his Best Actor award playing the old, canny composer, who roosts in a wheelchair in a private room, tinkling out melodies on a spinet. He believes that he killed Mozart, and the movie reveals the (fictional) story of how he literally scared the younger composer to death. With 35 entries (and more musical excerpts than that) on its soundtrack, playing this score would be a challenge for any orchestra. The Amadeus score was assembled from Mozart's vast catalog by the late Sir Neville Marriner, and it makes encyclopedic use of his operas, piano concertos, serenades, divertimenti and choral music. Although it only scratches the surface of Mozart's output, the music is cunningly employed, and as played by the New York Philharmonic, the music gained renewed emotional force. The second act charts Mozart's rise, his arrival in Vienna and his disputes with his controlling and manipulative father Leopold. The theater cut of Amadeus (shown here) is twenty minutes shorter, and omits some key subplots, sheds more light on the relationship between Salieri and Constanze Mozart (Elizabeth Berridge) and includes a very funny turn by Kenneth MacMillan as a wealthy Viennese burgher with a dog problem. Elements of The Abduction from the Seraglio and Le Nozze di Figaro remained, with much made over Mozart's struggles to get the latter opera produced. With the shorter running time, Salieri's presence in the center of the movie was somewhat diminished, although it was interesting to hear the Philharmonic play the slam-bang finale of his opera Axur, Rei d'Ormus. From this listener's perspective, the most challenging part of the performance came as the movie hurtled into its third act. The musicians had to show Mozart's last days, and his simultaneous, rapid-fire progress on The Magic Flute and the final, unfinished Requiem. So they had to switch willy-nilly between singspiel and death mass, occasionally interjecting the thunderous diminished seventh chord that announces the statue in Don Giovanni. The "statue chords" become associated with Salieri's plan to destroy Mozart, and appear with increased frequency as the plot unfolds. Best of all: the climactic scene in which a harried Salieri takes down Mozart's ideas for the "Confutatis" section of the Requiem, with orchestra and chorus sounding the individual instrumental and vocal parts before sounding a collective storm of musical hellfire. The only smirch on the Amadeus-in-concert experience (heard by this writer at the Friday 11am matinee) came in the closing. With Mozart dumped in a mass grave and Salieri in the insane asylum, the audience was treated to one last sounding of Tom Hulce's high-pitched "Mozart giggle." Following this, the movie faded to black and the credits rolled, accompanied by performance of the exquisite slow movement of the D minor Piano Concerto. However, the orchestra's performance and pianist Eric Huebner's spotlighted rendition of the solo spot was met with mutters, shuffling, and audience members streaming for the exits as if they were at the local mall. Mozart would no doubt be rolling in his unmarked grave. If only we knew where it was.